Normally, your tour guide will pick you up around 8:30 at the lobby of your hotel. He or she will confirm the exact time with you at around 19:00 of the day before your tour. Feel free to tell him or her if you have any requests. Zhujiajiao is one of the nearest water towns away from the urban area of Shanghai. Its traditional atmosphere is completely different from Shanghai city. If you want to relax yourself and learn some exquisite water town culture, Zhujiajiao is a good option. Fangsheng Bridge, 70 meters long and 7.8 meters high, is the largest stone arch bridge. Standing on the bridge, tourists will get a charming view of a river and the houses on the banks of the river. 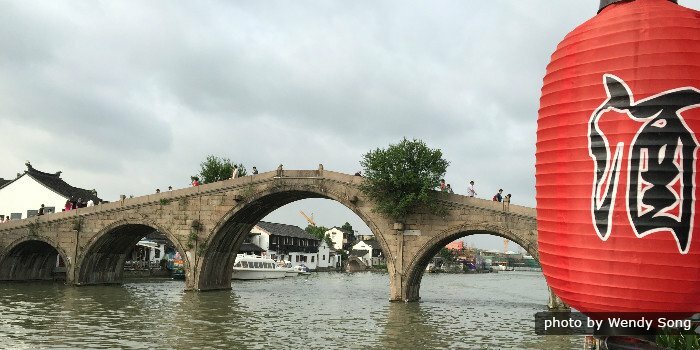 In a word, it is the best place to enjoy water town view in Zhujiajiao. Baoguo Temple, an important place to learn Buddhist culture in Zhujiajiao, was initially built in 1640 AD. Besides, there is a 20-meter-tall tree in the temple. It is said the tree is over 1000 years old. There thousands of Chenghuang Temples in China. They were built to commemorate local heroes. The Chenghuang Temple in Zhujiajiao was built in 1763 AD. Not so many people know which hero the Zhujiajiao Chenghuang Temple was built for. However, lots of people visit the temple for its beautiful views. With a history of around 50 years, Zhuxi Garden is one of the youngest gardens near Shanghai. But the views in the garden are as charming as other ancient gardens. The Chinese Zodiac Corner is a must-visit part in the garden. Statues of 12 lovely zodiac animals are welcoming you with their unique dance. These four major attractions are recommended by our experienced tour guides. They will help you get the most authentic Zhujiajiao experience with their abundant knowledge on the water town. Your tour guide will find a local restaurant for you to try local foods. After lunch, you will be transferred to Qibao Old Streets. The price of this tour will rise during the China National Day holiday (September 30th to October 7th) and Chinese New Year holiday. This is a private tour. The local private English-speaking guide and the private car will serve your group only. You will receive a confirmation letter within 24 hours of making your payment. Your guide will contact you in the evening (Your guide will call you at around 18:00. If you missed your guide’s phone call, he or she will send you a short message) before your tour and confirm the exact pick-up time according to your preference. Your guide will pick you up in your hotel lobby on the tour date at the appointed time. The meal (if included) is in a Chinese restaurant and your guide will help you order the dishes according to your taste. There is absolutely no forced shopping. An extra fee applies if you need to be picked up or dropped off from/to airports or cruise terminals.